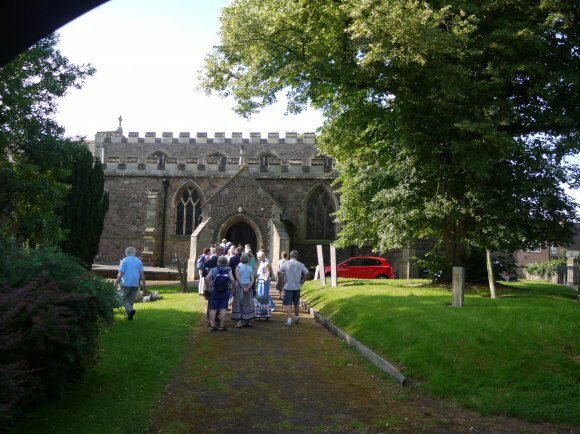 Volunteers heading for Rothley Parish Church for the briefing about the Big Dig. Following this, the volunteers made their way to the Old School Rooms to collect their spades, sieves, specimen bags and everything needed to start digging their pit. This was a very exciting weekend where the whole of the village could take part in one way or another. Some wanted to do a 'dig' in their garden and other preferred to work in the Village Hall washing and bagging the finds. Our pit, Pit 29, was in the grounds of The Grange in Fowke Street with the permission of the Kingsdale Management Company. Each test pit measured 1 x 1 metre with the first spit being 10cm deep to a maximum of 100cm, each spit of 10cm. A sketch was made of the exact location of the pit and details of the soil. Photographs were taken during the dig. Every dig had an archaeologist present at all times and supervised by a member of ULAS (University of Leicester Archaeological Services). Finds were put into bags with Pit Number and Spit Number and dated. These were collected from time to time and taken to the Village Hall where teams were waiting to start washing and returning to the bags marked with the relevant information. Of course, there was a lot more to it than just digging a hole! The event was organised by Charnwood Roots and thanks go to Dr. Julie Attard for all her work liaising with the committee in Rothley right through to organising the Big Dig Results day on October 1st 2017.